I'm so mad that I didn't try this place the last time I was back in the city. Damn that rain. And wind. And hurricane like conditions. 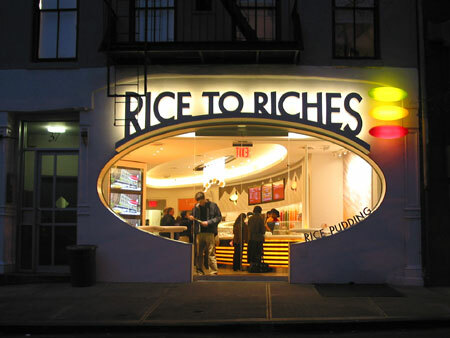 Any who, Rice to Riches is a one of a kind place. All they specialize in is rice pudding. Not quite what you'd expect, right? Well, their concept is similar to that of Pinkberry and Red Mango, except instead of frozen yogurt people can try different toppings on their rice pudding. Now, I don't know about you but rice pudding was one of my favorite desserts growing up. I would always have it after my burger and fries at the neighborhood diner, with the typical cinnamon topping. Rice to Riches expands on that cinnamon and such flavours of theirs include; graham crackers, espresso crumbles, and toasted coconut. They even have different rice pudding flavours. (All the flavours change daily so feel free to check them out more than once a week.) Even if you're not a fan of rice pudding, check out their website. It's got amazing animations and is quite informational. So, definitely check this place out if you're looking for something different to try in the city. And as always let me know what you think! aww... Your posts always make me sooo hungry!